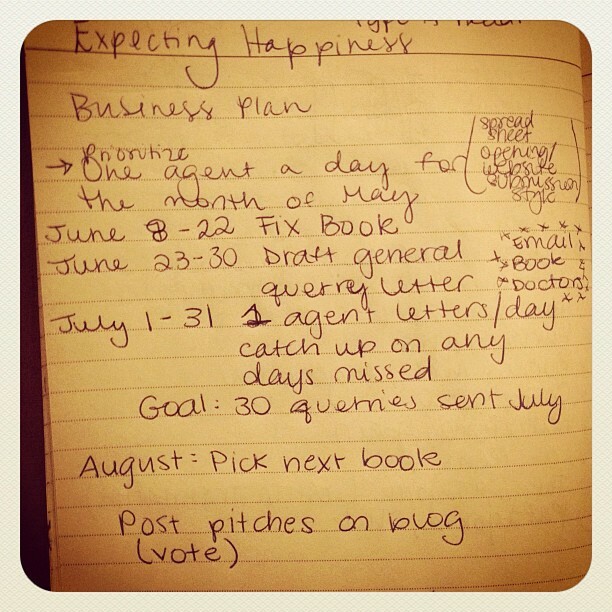 100th Post: Writing Business Plan! May – June 7: Research one agent/day to add to my query list. Create spreadsheet to record submission guidelines, contact info, why I selected each agent. I already have a list of 7 agents that represent authors that either are young/up-and-coming or wrote books that I enjoy. Goal is to have 30+ agents on my list for summer. June 8 – June 22: Hello summer vacation. Two weeks to edit/revise my manuscript before submission. June 23 – 30: Perfect my basic query letter, (to be tweaked based on information gathered on individual agents above). July 1 – 31: Submit query to minimum one agent/day, making up for any days missed on subsequent days. Goal 31+ agents in 31 days. August: Post pitches for next book to blog, commit to next book idea, (I have four!). Even if nothing happens to the first book, I am determined to keep moving forward. September – October: Research background information for next book, read similar books, non-fiction texts to support experiences in book. November: Nanowrimo! Time for another 50,000 words! At this rate, I should produce at least one book/year, (last book began in July, got rolling in November, will be finished June). Last, but not least, I have to celebrate that this is my 100th post! It has apparently been a very wordy year. I love lists/plans/notes/calendars. They give a sense of control over the future, making huge tasks feel attainable.